In September, Keli and I attended RBARI's 8th Annual Mutts Marathon, held at Bergen Community College in Paramus, NJ. We weren't sure what to expect, since it was our first time at this event, but we had a great time! In August, shortly after we signed up for the marathon and set up our fundraising page, we began our 'training', going on really long walks along the Ramsey bike path a few times a week so that we would be able to make the 2 mile walk. 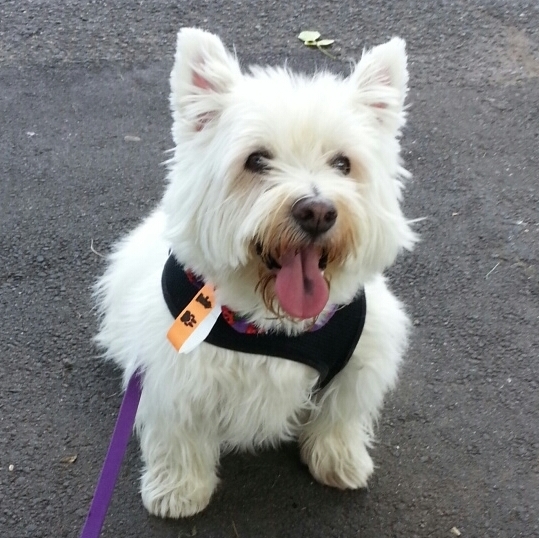 Keli did really well on our practice walks, so by the time the day of the marathon arrived, I felt she was well prepared. We arrived at Bergen Community College right at 11 am to check in and we were given a t-shirt and some other goodies. The walk didn't begin until after 12:00, so we decided walk around and check out all the vendors booths. Our vet, Ramapo Valley Animal Hospital was one of the event sponsors, so we made sure we stopped by to say hello. We also stopped at a booth that had an agility course set up, but Keli was more interested in the treats than trying to walk around or jump over poles, lol! Penny probably would have loved it. 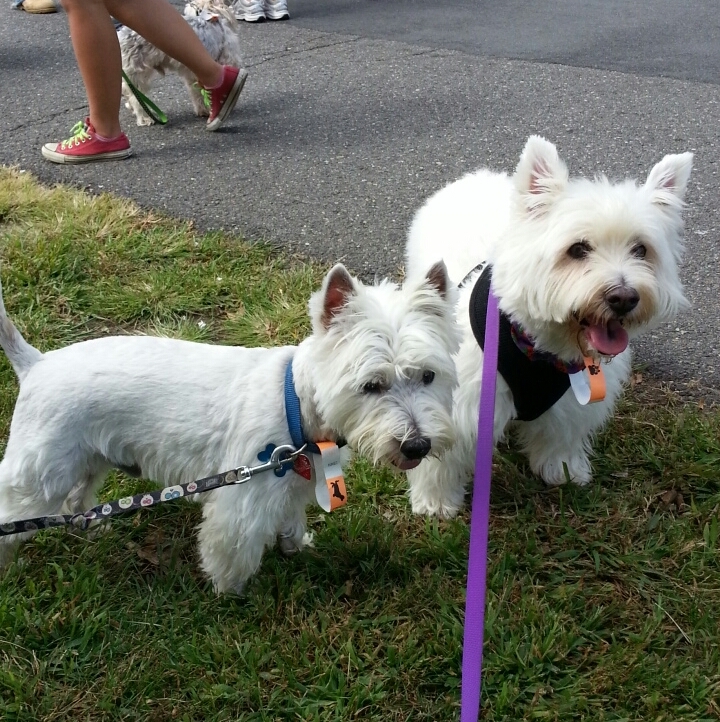 While we were checking out the vendors, we met another Westie, and he had a Wauzer brother, just like Penny. 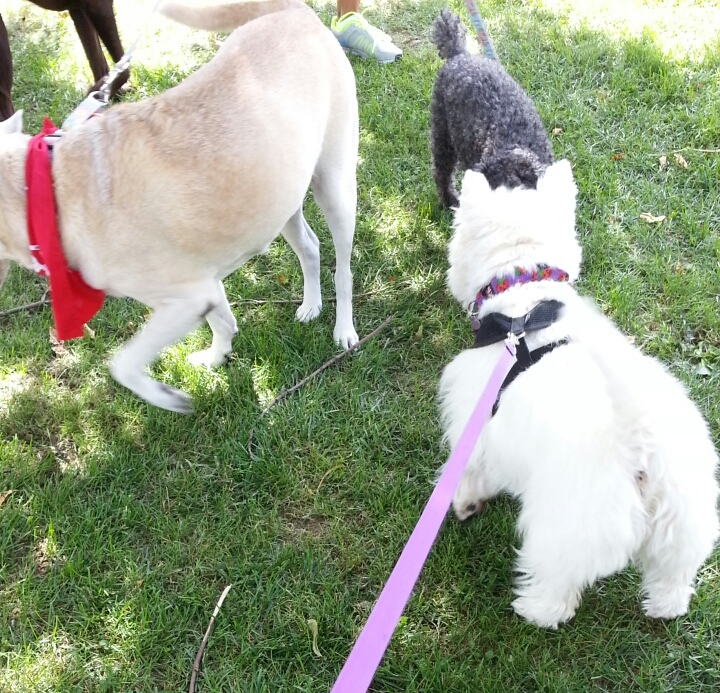 Keli had so much fun meeting all the other dogs! 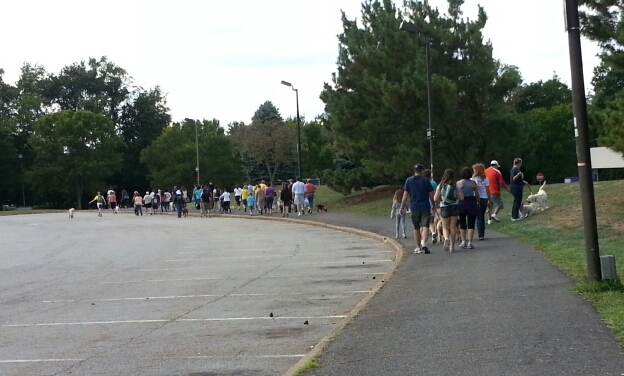 When the walk finally got started, we were at the back of the pack. 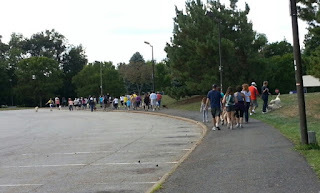 We walked down the driveway of the college, along Paramus Road and then crossed over to the Dunkerhook Area of the Saddle River County Park. 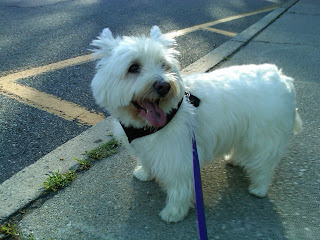 It was a brisk walk and we were able to keep up for most of it. When we started back towards the college, Keli got a little tired and stopped to sniff more and more ... so as it turned out we were the very last to finish the marathon. Here she is, cooling off after the walk - she still looks pretty happy about it! After we had a chance to get a drink and catch our breath, we walked around again and played some of the games and tried to watch some of the contests. By 2:00, I was ready to head home and Keli didn't object. We had set a goal of $100 for our fundraising page and we almost made it with a total of $95 (donations are still being accepted through December 16). We're looking forward to attending next year's marathon, but we may try signing up as vendor instead of walking. Ramapo-Bergen Animal Refuge, Inc. (RBARI) is one of the animal charities that I support by donating a percentage of sales of select items from my SewAmazin shop on ArtFire. To celebrate Penny's 5th birthday, we donated an extra 5% to WestieMed and RBARI for every item sold in my SewAmazin shops during September. In October I sent our quarterly donations for July-Sept to WestieMed ($75) and Ramapo-Bergen Animal Refuge ($30); the donation total for both in September was $34.00 which included $11.50 specifically for Penny's Birthday. Many thanks to everyone who shopped with us in September and supported us in the Mutts Marathon!